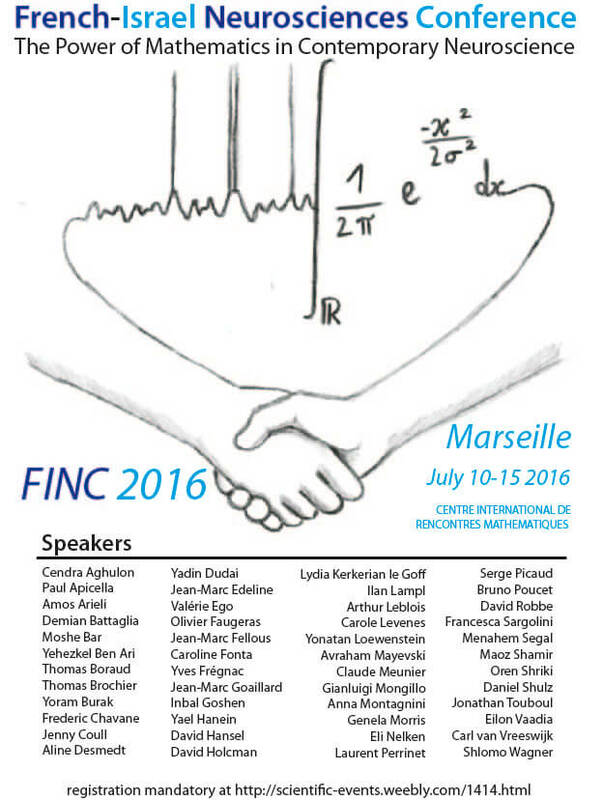 We have the pleasure to open a slot for 10 PhD students registration to a special event that will take place in Marseille on the 10-15 July 2016 Since 2004, the French-Israel Neuroscience Conference (FINC) brings together, every other year, scientists from France and Israel with the aim of promoting bilateral cooperation in Neuroscience. The forthcoming conference will be the 6th edition in the series. It will take place on 10-15 July 2016 in Marseille (France) at the International Center for Meetings in Mathematics (http://www.cirm-math.com), which is sponsoring the event. Over the past decade technological advances across several disciplines have dramatically expanded the frontiers of experimentally accessible questions in neuroscience. Current experimental approaches produce a tremendous amount of data, on a broad spectrum of temporal and spatial scales, providing finer and more quantitative descriptions of the biological reality than we dared to dream about only a decade ago. We believe that making sense of these data necessitates guidance through a parallel revolution in theoretical neuroscience. The goal of FINC2016 is to contribute to this challenge by bringing together French and Israeli neuroscientists who will paint the current status of theoretical and experimental neuroscience and identify what is needed to move forward. The conference will last for 5 days. It has been designed it to review a number of several ‘hot’ topics. The program is attached to this mail and will consist of 8 half-day thematic sessions. Each thematic will be dedicated to specific scientific questions from the experimental and the theoretical standpoints by a “duo” or a “trio” of speakers (30’ each). Talks on each thematic will be followed by a discussion (30’) chaired by another experimentalist/theoretician duo. The chairpersons and the speakers will coordinate in advance the content of the presentations and the organization of the discussion to guarantee the success of the session. Chairpersons will also coordinate with the speakers to write a short account of their session, presentations and discussions. Our hope is that the conference will lead to a roadmap for a better synergy between theoretical and experimental neuroscience. If you are interested to follow the event, at least a significant part of it, please register at AMETICE. The selection will be of the first-come first-served basis, so do not wait too long. You will have to let us know in advance whether you intend to participate to the entire sessions or only at part of them (evidently, we will not accept that you see only one session, a minimum of 4 is required).